Ask a selection of runners about the advice they would give a new runner, and invariably you will hear “go and have your gait analysed”. But do we fully understand what Gait Analysis is? ‘Low arch’ runners – overpronators and recommended a motion ‘control’ shoe. We can now point to research which has fairly conclusively shown that this practice of using arch height is far too simplistic (1). Though the idea of what ‘feels’ most comfortable sounds very simplistic, there is as much evidence for that potentially reducing injury risk than prescribing the runner a shoe type based on the arch type! So what is Gait Analysis? Just looking at somebody’s feet is not what should be considered gait analysis; it is much more than that. A full gait analysis looks holistically (a word I fear that has been stigmatised by candles, auras and pan pipes) at the interaction of the whole body and evaluates how movements in one area may be contributing to compensations in another. It is widely accepted now that we need to consider the mechanics of the hips and trunk of the body and the role they play in controlling movement seen in the lower leg (2). There is an increasing amount of evidence linking movements in hips with overuse injuries in the lower limbs (3). Full body video gait analysis can help with this. By highlighting these dynamic weaknesses, addressing the issues and improving running form, we can often intercept potential problems. Will a pair of trainers strengthen that weak link? Almost definitely not. But it will highlight it. 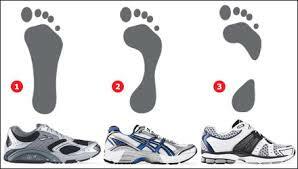 Therefore, we can safely say that if your gait analysis looks at just your foot – it is not gait analysis. Ideally, we would want 2 views, back, AND side to see exactly what movement patterns are arising. Of course we have to accept that a treadmill based gait analysis will always have its limitations; for one, we must accept that running on a treadmill is not what most recreational runners do – we run outside and running on a treadmill does not replicate this 100%. Secondly, there is evidence to suggest that it takes around 6 minutes of running on a treadmill for the gait to ‘normalise’ (4). These are the reasons that a proper gait analysis takes great skill and experience – locally, I strongly recommend Run Swindon, in Wood St, Swindon (http://www.runswindon.co.uk/). So do I think running shoes are a panacea? No. Do I recommend gait analysis? To some people, absolutely. I work with a lot of runners, and shoes are – have been, and always will be despite the explosion of ‘bare foot’ – a part of the question, and solution to running injury free. This entry was posted in Uncategorized on 15th September 2015 by DCInjuryClinic.